Gideon’s Sword – Remnant Rescue Series | Book 3 begins immediately after the Rapture when the multi-national crew of the International Space Station (ISS) watches atomic wars destroy most of the United States and their aftermath kill one-fourth of the world’s population. National allegiances on the space station soon split between the majority-Russian crew and two friends—an American and Israeli. When a Russian resupply ship approached the ISS with food and supplies, astronauts Ryan Legend and Gabriel Weiss take drastic action that saves their lives. They dub their new home the Blue Star. The two astronauts’ rescue from space comes from an unlikely place when the Remnant Rescue organization rebuild a rocket found in an aerospace museum and launch three of their own astronauts to the Blue Star. What the two castaway astronauts think is a rescue mission turns out to be an ingenious space shield as Jews enter a time period known as Jacob’s Trouble or the Great Tribulation. 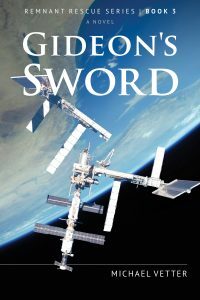 Gideon’s Sword is also the name of a space platform from which captured Israeli atomic missiles with non-lethal electromagnetic pulse (EMP) warheads rain down on Imperium forces. A Syrian mechanized division, a strategic fortress, and the re-built city of Babylon all become targets. Not knowing the source of the mysterious attacks from space, the Imperium’s kingdoms turn on each other in a fierce nuclear exchange. Before the astronauts return home, they save a Christian from a space cruiser recently returned from an expedition to Mars in a race to dodge a satellite programmed to collide with what remains of the ISS and kill everyone.